Atlanta United, in just the Five Stripes’ second season, has won the MLS Cup, defeating the Portland Timbers 2-0 in front of 73,019, a record for the league’s title game attendance, at Mercedes-Benz Stadium. It’s the first championship for the city since the Atlanta Braves won the World Series in 1995. A parade will be held Monday in downtown Atlanta. Martinez, who is from Valencia, Venezuela, scored for Atlanta in the 39th minute. His 35 goals, from the regular season and postseason combined, are an MLS record. Five Stripes fans, as they have all season, responded to his efforts with a throaty roar. The second goal was by defender Franco Escobar, who hails from Rosario, Argentina, in the 54th minute off a set piece. It started with free kick from Paraguayan Miguel Almiron — who is rumored to be moving to play overseas and perhaps played his final game in an Atlanta uniform — which was headed by Martinez to Escobar for the score. Saturday’s win was the final game for head coach Gerardo “Tata” Martino, who previously announced he was leaving the club after this season. “If I had to choose the way to leave somewhere, this is the best way,” the Argentine said through a translator. It also was a breakthrough for defender Michael Parkhurst, who previously lost four times in the final when he played for the Columbus Crew in 2015 (which came against Portland) and the New England Revolution in 2005, 2006 and 2007. Portland, who upset the top two seeds in the Western Conference to reach this stage, is the second team seeded fifth to reach the MLS Cup, the lowest to reach the championship game. The other team to do it was Houston, when the Dynamo did it in 2012. For a while, it appeared as if the sports teams of Atlanta and Georgia might be jinxed. The Atlanta Falcons blew a 28-3 lead in Super Bowl LI to the New England Patriots in Houston. The University of Georgia suffered heartbreak twice this year against the Alabama Crimson Tide in Mercedes-Benz Stadium, squandering leads to lose the College Football Playoff national championship in January and the Southeastern Conference title game last week. The Hawks haven’t won an NBA championship since moving to Atlanta in 1968. The NHL left the city — twice. And aside from winning their lone title in 1995, the Braves came up short multiple times in the playoffs despite winning a staggering 14 consecutive division titles from 1991-2005. While it is well known that professional and college football are popular in the South, it wasn’t immediately apparent that another kind of football — the global one — would resonate as well. But it has, and more. 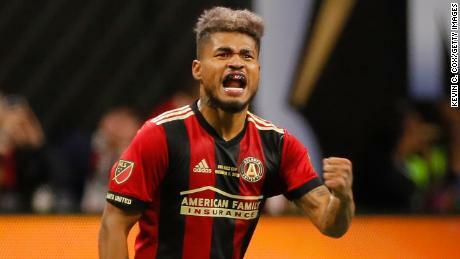 According to Forbes, Atlanta United is the most valuable team in MLS at $330 million. The fan base spans multiple ages, races and languages. Atlanta United drew 901,033 fans for their 17 home league games, a league record. According to the club, Atlanta United’s season average of 53,002 fans per game — also tops in MLS — ranks 17th the world based on the 2017-18 season, ahead of Italy’s AC Milan. “It’s something that we’ve become accustomed to,” said goalkeeper Brad Guzan, who previously spent nine years in the English Premier League, most recently playing for Middlesbrough before spending the previous eight seasons with Aston Villa. Known as a city of transplants, Atlanta sometimes has had a reputation for not always pulling for the home team in its respective sports. According to US Census data from 2010-2014 analyzed by the Atlanta Regional Commission, 37% of the population in metro Atlanta was born in another state, and there are also large groups of residents who were born in other countries. But Atlanta United has had no trouble from the start in getting support. There’s no relegation in MLS — not that Atlanta ever would have had to worry about that. From the beginning of 2017, this team was built to win, becoming the fourth expansion team in league history to reach the MLS Cup playoffs.